Remember that whole song and dance about trying to watch my carbs? Well I had one trip to the beach and that went right out the window! How can you have a Memorial Day holiday and not eat…well…carbs? Buns for burgers and sandwiches. Cookies and baked goodies. Potato salad. I have to say that I have a certain amount of snottiness and nostalgia about potato salad. No one could make it as well as my mom could. Her recipe? Some globbed up concoction of eggs, mustard, mayo and plain ‘ol russet potatoes. Was it very good? Looking back, I’m not so sure…but that’s how she did it so that’s the way it should be! This past holiday weekend, I made two different kinds of potato salads. The first was the Mesa Grill potato salad, courtesy of Mr. Personality – Bobby Flay. It was so spicy and complex and delicious. However, when all of the ingredients were combined, it looked like a CSI crime scene photo. It’s definetely one from the "Looks Like Crap, Tastes Like Delicious" files! The second batch was a Jamie Oliver recipe that I have been wanting to try for some time. I saw him make it on his show a long time ago – throwing handfuls of herbs and seasonings together all helly-nelly like. It was so loose and full of really fresh flavors. It seemed like it would be such a light and original version of what i consider to be a very heavy dish. I was right – the creme fraiche and the lemon just barely coat the potatoes. I just seasoned it with herbs and lemon zest to taste and added some dried red chili flakes for occasional heat. Some words of wisdom: be prepared to re-season after it sits – it seemed to soak up the salt and pepper as the flavors melded together. Make the dressing by mixing together the olive oil, lemon juice and crème fraîche or fromage frais. Cook the potatoes in plenty of boiling salted water for around 20 minutes until tender, and drain well. When the potatoes are cool enough to handle, rub off the skins with a knife and slice into bite-size pieces. Mix with the dressing, then add the radishes and herbs and season well to taste. I was going to make a Bobby Flay potato salad this weekend too. I’m not sure if it’s the same one on the Food Network site, it was his Southwestern Potato Salad from the Mesa Grill Cookbook. However, I was tasked to make other things so we just decided to buy potato salad instead. I can’t believe you made two! You must have been chopping all weekend. It *is* the same one! It was a LOT of prep work…but worth every bit of it. Everyone loved it…so if you have the occasion, try it! 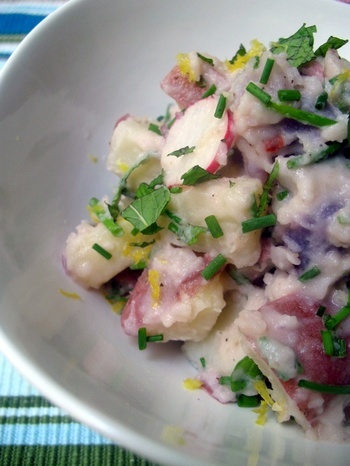 Creme fraiche + purple potatoes = serious goodness! i’ve made that booby flay potato salad (and others by him) and i agree, Tastes Good Looks Like Poop. so one must get over the looks. i too am extremelly picky about my potato salad, but not for the same reasons you have. i never had it growing up, so i had to ease myself into liking it. I’m not really one for potato salad or any of the classic Memorial day “salads”. Yours does look better than the average potato salad though, I must say.